Behaviorism research papers for sociology and psychology are custom written for college and graduate students. This is a psychology research paper on behaviorism. An article on behaviorism will be analyzed. Behaviorists theory is concerned with observable and measurable behaviors and with the environment and procedures that produce or discontinue observable behaviors, rather than unobservable elements such as insight, motivation, or identity. In many respects, modern behaviorism is based on the inevitability of control in the learning process. That is, they believe that behavior is learned, and particular actions determine particular behaviors. Therefore, behaviorist theory contends that behavior can be influenced and intelligently modified. The system of behavior modification that is a result of behaviorist theory attempts to shape behavior through a variety of processes known as conditioning. 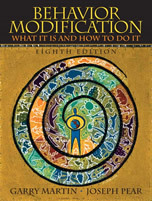 This concept of conditioning and behavior modification is at the heart of behaviorism's practical applications. Its basic principle is that behavior is a function of its consequences and the probability of a behavior's recurrence depends on the events that proceeded that behavior when it occurred earlier . In theory, behavior can be increased or decreased, depending upon the consequences. In this way, behavior may be encouraged by rewards or discouraged by punishments. The efficiency of behavior modification as described above depends upon the control of the consequences. The nature of reinforcement, behaviors to be modified and other elements of behavior modification require an individualized approach. However, behaviorism has been successfully applied to group environments, as well. Critique the article-did you find it credible? Why or Why not? Do you agree with the conclusions drawn in the article? Why or Why not? How did the articles affect or change your thinking about behavior management and/or behaviorism? How do you think your future practice will be affected and or/or changed as a result of reading this article? Neobehaviorism is an extension of behaviorism that was created by Edward Tolman. Identity Theory term papers write about the philosophy paper topic of mental states and human materialism. Psychology Schools of Thought - Major psychologists of the 19th century and 20th century, including Sigmund Freud, B.F. Skinner and Abraham Maslow all contributed. Conclusions and Recommendations for research papers. Paper Masters writes custom research papers on Behaviorism for college and graduate students.